With a colorful personality, the Lafresnaye Macaw is all the fun of a large Macaw rolled into a smaller package! A rare subspecies of the Severe Macaw, it is just as friendly and playful and slightly larger! Lafresnaye Macaws are found in tropical forests up to 5000 feet in altitude and stray occasionally into villages or cultivated areas. They love treetops and often associate with other Macaws, making lots of noise while they forage for palm fruits, nuts, seeds, and berries. They breed between January and April in northern ranges and November to January in southern ranges, nesting in very high dead trees or branches. Living in small groups of three to 15 in the wild, the Lafresnaye Macaw is extremely social and loves to mimic speech and be petted and played with! The Lafresnaye Macaw is about nineteen inches in length and is crowned with a line of chestnut colored feathers across the forehead. The plumage is primarily metallic green, and the crown is blue. The shoulders are red. Lafresnaye Macaws have blue flight and tail feathers with red undersides. Their bare facial patch exhibits delicate feather lines, the chin is a dark reddish brown, and the underside of the tail is a dark chestnut color. The bill is black and the legs are dark gray with red “socks”. Lafresnaye Macaws have brownish-red irises. 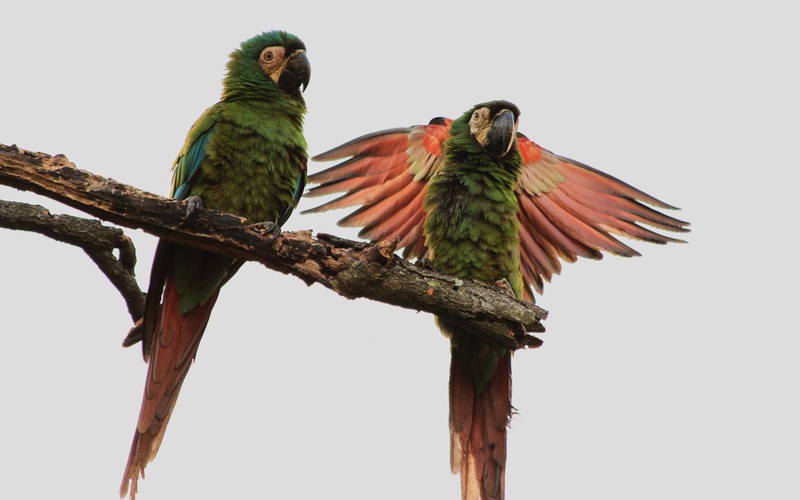 The wingspan of Lafresnaye Macaws is nine to ten inches. When setting up pairs, Lafresnaye Macaws must be sexed using DNA or surgical methods. 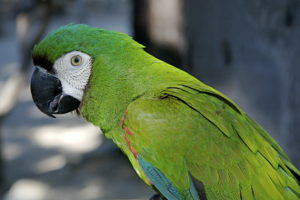 Immature Lafresnaye Macaws will have blacker colored bands on the foreheads, as the chestnut color develops with maturity, and you may use this indicator to determine the bird’s breeding capabilities. 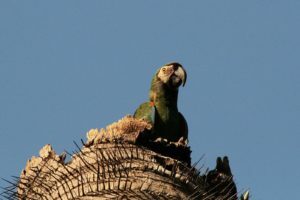 Lafresnaye Macaws are native to northern Venezuela up through the Guyanas and south to northeast Brazil. They range through coastal Columbia, eastern Panama and Peru, and northern Bolivia. They are little known as companion animals though they make wonderful family pets when captive bred and hand raised and remain quite rare. Lafresnaye Macaws do well when fed on a variety of foods including; fruits, vegetables, and commercial pellets. White bread and biscuits are the perfect food to hand rear young Lafresnaye Macaws. Pasta, beans, pine nuts, and porridge all make fine treats for Lafresnaye Macaws. They also need fresh water at all times, and love bathing! Because of their smaller size, Lafresnaye Macaws will do well in an outdoor nine by three by six food enclosure with an enclosed shelter. Lafresnaye Macaws do best if kept in pairs within hearing distance of each other. They are quite noisy and need lots of attention to prevent loneliness and depression. They are sturdy after acclimatization but should not be kept below 41 degrees Fahrenheit. In captivity, Lafresnaye Macaws are quite prolific if paired correctly. The breeding season usually begins in May, when Lafresnaye Macaws may become aggressive, attacking similar sized birds or their handler. Give your birds a diagonally oriented nesting box with a twelve-inch entry hole and 10 by 14 by 16-inch dimensions. These Macaws usually have clutches consisting of about four eggs that hatch in 26 days. Generally, not all the eggs will be fertile. The fledgling period lasts about twelve weeks and young Lafresnaye Macaws are quite independent two weeks after leaving their parents.